Searching for the best movers in Centreville, VA? Then you've come to the right place! My Guys Moving & Storage serves the entire Centreville area and surrounding areas such as Chantilly, Clifton, Fair Lakes, and South Riding. Whether you're moving across town, across state lines or even across the country, our Centreville movers are here to help. We have the experts to ensure the process goes as smoothly as possible and that your items are kept safe during transport or while in storage. Learn more about our services and then give us a call to schedule your move today. 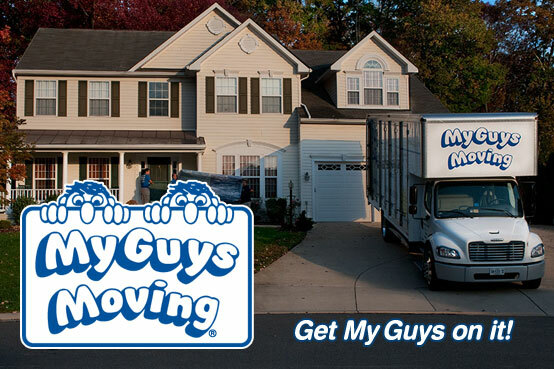 Licensed, Bonded & Insured: My Guys Moving & Storage - local movers in Centreville, Fairfax County, VA. We provide expert local moving and packing services at an hourly rate, plus travel time. Our rates may vary based on the date and time that you need to move, so please call or email us for our current prices. You can generally save money by moving mid-week, mid-month when demand is lower. Our competitive rates are based on the time your move takes and the number of guys needed to complete your move. There is also a trip charge added to account for the time spent getting our Centreville movers out to you and back home again. When you give us a call or email us, we'll ask for some specifics about your move in order to give you an estimated cost. The time of your move starts when our guys arrive at your loading location and continues until the work is completed at your final destination. It includes the time spent traveling between your various locations as well. We generally say that it takes one to one-and-one-half hours of moving time per fully furnished room. Remember that it may take a little longer if you live in a location with an elevator or multiple flights of stairs, or if there is a long walk from where the truck can park to your front door. You have a lot of choices for movers in Centreville, VA, but by choosing My Guys you'll get a great price and the expert movers you deserve. We'll find the best storage solution to meet your needs. MY GUYS will come to your home, load your belongings and then unload them into the storage facility. We'll take care of all the hard work for you. Once you're ready for your items, our professional movers will bring your belongings wherever you need them to go – it's that easy! Give us a call today to learn more about our storage options. Are you moving out of the area? No problem! We are a full service moving company that can help with everything from packing to storage to moving. We're the experts, so you can count on us for a stress-free experience. We'll be there to pack up your current home if you need assistance, safely transport your items to your new location or to storage and finally unpack everything at your destination. We have our own U.S. Department of Transportation permit for interstate moves, which allows us to control every step of the long distance moving process. This way you can rest easy knowing that you have one point of contact throughout your entire state-to-state move from beginning to end. Whatever your needs and wherever you are moving around the country, we are the movers to call. Need packing supplies but not sure where to get them? Don't worry – we've got everything you need! Many of our customers are concerned about transporting their clothing. Wardrobe boxes, essentially a portable closet, are the perfect solution for many people. Your clothes are hung in the box from a metal bar. Each box holds 18 to 24 inches of clothes hanging on a bar in your closet. These are available for your use on the day of the move for a rental charge of $7.50. We also carry a full line of packing supplies including boxes of varying sizes and specially made cartons for items such as flat screen televisions, plates, mattresses, mirrors and more. Best of all, we offer FREE delivery for all orders over $100. As you can see, we are the Centreville movers to call if you want to ensure you have all the supplies you need! Call 703-449-1155 or simply fill out the Free Moving Quote form on this page and One of the Guys will be right with you! Thanks for contacting MY GUYS! Proudly moving Chantilly, Clifton, Fair Lakes, South Riding. Moving Companies in Centreville, Virginia movers, Fairfax movers, 20120, 20121, 20122.